Hawk Performance offers both street perfmance and racing compounds in probably the widest available range of vehicle applications. HPS COMPOUND -The High Performance Street compound offers a higher coefficient of friction over stock brake pads and can provide you 20-40% more stopping power and higher resistance to brake fade than most standard replacement pads. Less fade means you will have a highly durable brake pad with less brake dust. HP Plus COMPOUND - HP Plus brake pad compound is intended for Autocross and Track Day drivers looking for a high performance race compound that can take the heat of the track and get you home safely without having to change out brake pads. DTC 60 COMPOUND - High torque with less initial bite than DTC 70. Superior release and torque control characteristics. Brake pads designed for cars with high deceleration rates with or without down force. Recommended for use with DTC-70 when split friction between front and rear axle is desired. DTC 70 COMPOUND - Extremely high torque with aggressive controllable initial bite. Superior release and torque control characteristics. 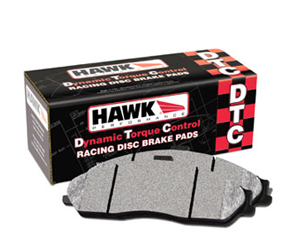 Brake pads designed for cars with high deceleration rates with or without down force.